So listen - even though some people might wonder why anyone would want to make one movie about morphing into a fly, there’s actually two movies about it! Both were called The Fly, and the first one was made in 1958, and was based on the 1957 short story of the same name by George Langelaan. It starred Vincent Price (because of course it did), and it told a story of a scientist who mutates into a grotesque human fly after one accidentally flew into his transportation machine and mixes their atoms. It was followed by two sequels, Return of the Fly and Curse of the Fly, because apparently people in the ‘50s and the ‘60s love being freaked out by movies about turning into flies! The movie as then remade in 1986 as a film of the same name. It starred Jeff Goldblum and Geena Davis, and though it was also loosely based on George Langelaan's short story, there were some notable changes. In this one, an eccentric scientist slowly turns into a fly-hybrid creature after one of his experiments goes wrong. It was a massive critical and commercial hit, with praise heaped on the special effects and Goldblum’s performance. It even won an Academy Award for Best Makeup. A sequel was also released in 1989. Anyway! If you're as fascinated with these movies as we are (hello, Jeff Goldblum!) 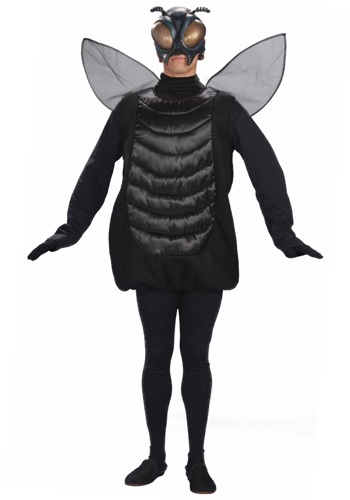 or if you just want a great get-up to pester all of your friends with, we recommend getting this Adult Fly Costume to create a huge buzz at your next costume party! In this Adult Fly Costume, you won’t be afraid to dive into the plasma pool - after all, all it’s going to do is destroy and recreate you!